TAIPEI, Taiwan, Jan. 3, 2019 /PRNewswire/ — After the excesses of the holiday period, the answer to the perfect drink could lie in a refreshingly smooth and clean gin by acclaimed whisky maker Kavalan, featuring a subtle blend of six botanical extracts. “The smoothness of our gins, like our whiskies, relies on the mineral-rich water we take from Snow Mountain’s springs, so it’s fitting we pay homage to it as well as gin’s juniper on the bottle,” Mr. Chang said. At the heart of the inaugural Kavalan Gin is the rarest of malted barley spirits, made from Taiwan’s purest water source and triple-distilled in Kavalan Distillery’s German stills to create a luxuriously mellow mouth-feel. An elegant expression of the natural bounty found in the fertile, subtropical land of Kavalan Distillery, this Taiwanese gin features six specially selected botanical extracts, 100% natural, including tangy kumquat, luscious star fruit and sweet red-flesh guava, giving this exceptionally fine gin its delicious aromatic complexity. Nose – Refreshing and elegant. Delicate aromas of juniper berries, soft aniseed and scents of coriander flourish, developing into an exuberance of zesty kumquat and citrus orange finish. Palate – Rich, pleasingly sweet, and long and full in body. A thick creaminess envelops the tongue releasing a distinctive sweetness from the red-flesh guava, starfruit, and zesty kumquat perfectly balanced by a burst of refreshing citrus. 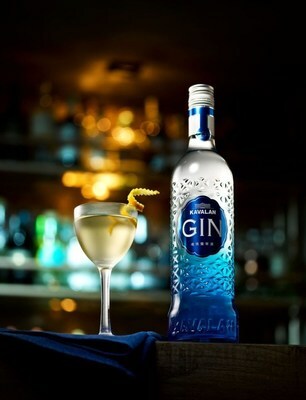 Finish – An elegance and enduring fruitiness that defines this smooth, clean gin. Yilan is famous for its zesty kumquats, which translates in Mandarin to “Golden Orange.” Larger than a grape, biting into a kumquat gives a big burst of tart, sweet citrus flavour. The tartness comes from the flesh and the sweetness from the zest, in contrast to other citrus fruits. Taiwan is one of the world’s largest producers of guavas, which is a delicate and sweet fruit, with green or yellow skin. Yilan has a reputation for the soft, red-flesh variety which has a divinely sweet flesh that melts in your mouth. Taiwanese Star Fruit are larger and more succulent than other varieties. With notes of pineapple and citrus, it is identified by five “ribs,” which create a star shape when sliced, Taiwanese Star Fruit is grown right across the country, with sweet and tart varieties, and has become a symbolic fruit for Taiwan. 2. In Drinks International’s 2019 Annual Bar Report Kavalan ranks 4th highest trending (In terms of requests by bar customers) and 5th best selling in the World Whisky category.